There can't possibly be a more incongruous and ridiculous matching of a team with a color than the Los Angeles Angels with red. Has anyone ever heard of a "red Heaven?" No, it's "blue Heaven." Someplace else is red, and the Angels look hellish for missing that point. Here is a good road look for the Los Angeles Angels, who wore these throwbacks in a July 27 game in Oakland. 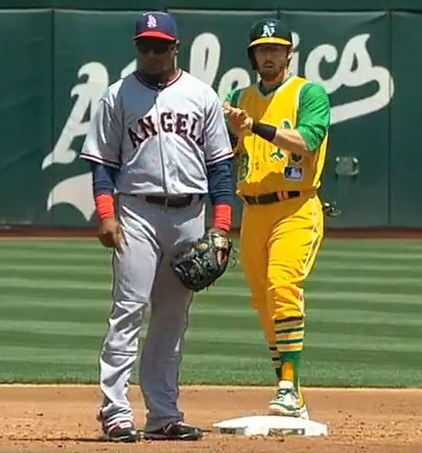 That's Erick Aybar, left, wearing the 1969 Angels uniform, and Eric Sogard, right, wearing the old duds of the Oakland A's (Big Leagues in Los Angeles graphic). Writing about athletic uniforms has become a cottage industry in the last several years, not only because the times demand effusions about trivia, but because teams actually sell the stuff now, and people wear it. We're from the school that wants to see the merits in any uniform and will decide that any design looks nice, so long as the team wearing it knows how to play baseball. A good baseball team can make a bad baseball uniform look good, and that even goes for the 1984 San Diego Padres. The sweetest uniform becomes a loser if the team wearing it is a loser, though we'll cut today's Miami Marlins a little slack because we like their young talent and think they'll turn into something. But there are exceptions, and one of them hits pretty close to home. Unquestionably, the most incongruous uniform design in all of professional sports is the Los Angeles Angels wearing red. Who ever thought this was a good idea, and why have Angels fans put up with it for so long? It's a complete mismatch thematically. Let's review. Angels are said to live in Heaven, which is way up in the sky, which is blue. The one place where you will not find angels is in Hell, which is fiery and, therefore red. Angels wearing red is just ridiculous. Red might be a good match for Orange County politics, but it does not belong on a baseball team called the Angels. Do you know, in fact, which other Angels wear red and white? Hell's Angels. They call themselves "The Red and White." Nothing against the Hell's Angels here. But maybe the right colors for Hell's Angels aren't the right colors for the Los Angeles Angels, the Halos, or the Seraphs, as the Pacific Coast League (PCL) team was once known. We all know that the Angels, the baseball team, has used red wordmarks almost continuously for more than 40 years. Up until 2002, though, the Angels offset their red wordmarks and numerals with blue caps and sleeves. 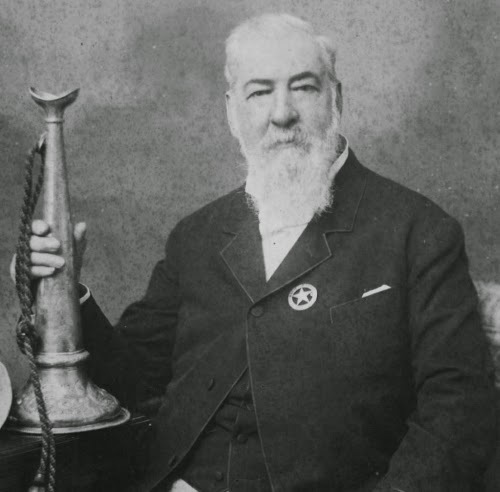 It's kind of a tradition that goes back to the old Los Angeles Angels of the PCL. The effect was to make blue appear to be the primary color, even when everything else about the uniform was red, including the stirrups, which went red in 1969. The red uniform trim offset the blue accessories and gave the whole ensemble a balanced, blended look that appeared to be based, nonetheless, on blue. In 2002, though, the Angels rushed to fill a void, as there were no red teams in the American League. We don't know if that's the reason, but an AL team wanting to look distinctive would have accomplished as much by wearing red, which the Angels did to the effect of looking distinctive. Way back in the 1960s, the Washington Senators were a red team, and the Cleveland Indians played back then a bit as a red team, too. In the National League, the Cincinnati Reds, the St. Louis Cardinals and the Philadelphia Phillies were red teams. The Reds and Cardinals, named as such, should always be red teams. For a couple of years early this century, the Reds tried being a black team with red trim, and it came off badly. During the late 1990s and into the 21st century, the American League's only red team was the Texas Rangers. Otherwise, the Angels, Minnesota Twins and Boston Red Sox all wore red wordmarks and numbers with blue caps and sleeves. But when the Rangers went blue in 2001, the American League was redless. Someone had to go red, just to be different. But it's hard to imagine a worse candidate for going red than a team calling itself the Angels. Then again, we've come to find that the Angels and unimaginably bad ideas go together. This franchise can't even figure out what to call itself. So, the Angels switched to red caps and sleeves in 2002. It would figure, of course, that the Angels would win the World Series that year. That uniform now is associated with the proudest moment in franchise history, and we are stuck with it. But this franchise has done so much better. Has there ever been a more clever cap design than the blue cap with the halo on it that the Angels wore for the first ten years of their life? It's so distinctive, and so appropriate for the Angels. The halo on the cap should be as attached to the Angels as the pinstripes to the Yankees. One would think that a franchise trying to market itself in Los Angeles would latch onto a good branding idea like this, but the Angels have frittered it away. One doesn't hear any talk about the Angels contemplating a uniform redesign anytime soon, but it is badly needed. The red look, which does not get the ridicule that it deserves, really needs to go.